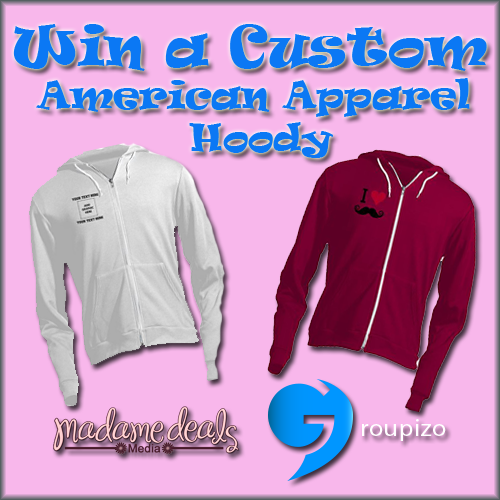 Enter to win your own custom American Apparel hoody from Groupizo! Or, you can choose from hundreds of customizable products! Design and sell your own designs on Groupizo! These are a great idea for fundraising events especially for your school There are tons of great opportunities with Groupizo! Learn more about the prize and our sponsor below! Groupizo is a group funding platform providing a quick, painless, and social way to generate revenue for a cause, or just to sell your own designs. Creating a Groupizo Event involves zero overhead, zero production costs, and zero risk, and takes only minutes. After selecting your product (or products), and creating and/or uploading your own artwork, all you need to do is set a selling price, set a closing date and decide on a custom url. Your supporters will then place orders online through the Event page. At the close of each Event, they produce and send the custom products to each supporter. Profits from the Event go directly to the Event organizer. Winner will receive a Custom American Apparel Hoody. Giveaway will begin 8/3 at 12:01 am EST and will end on 8/17 at 11:59 pm EST. Open to US and Canada. Disclosure: Participating bloggers are not responsible for prize fulfillment. Prize fulfillment will be handled by the sponsor. Please email Madame Deals Media for any questions. See our full disclosure policy on the site. Thanks for sharing this information. Will definitely join this.